I was asked a question recently (at Home Model Engine Machinist) on how the end plates for the boiler currently under construction were formed. Copper is a malleable material an it annealed state and this means that it can be beaten into shape around a former. During the forming process it work hardens and needs to be annealed again. You can tell when annealing is required because the sound of striking it changes and it stops being easily worked. Annealing copper in the home shop is pretty easy - I just place it in the hearth (a bunch of fire bricks in the middle of the floor) and heat until dark red hot with a torch. You can leave it to cool in air or quench it - I quench it because I have no patience - the point being that it is the heating that anneals not the way it is cooled. To shape the copper, you'll need a former; something over which you will hammer the copper. For boiler end plates, I use aluminium. Here are the formers for the 3" vertical boiler fire-tube endplates. They were turned in the lathe and the diameter is the inside diameter of the boiler shell less twice the thickness of the tube plate. The hole through the middle is calculated in a similar way. The outer flange is formed by clamping the annealed tube plate between the two formers a beating the copper with a soft faced hammer. Here is is this process illustrated using formers for the end cap of a small butane gas tank. 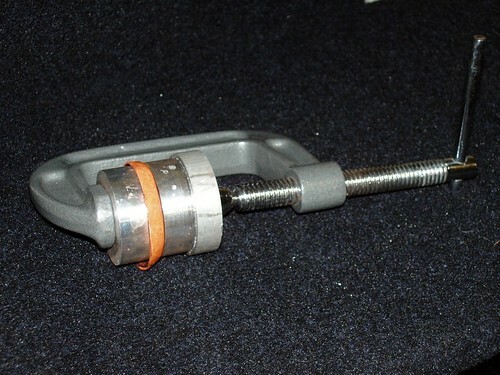 Some people use a vice, but for smaller plates, a substantial G-clamp can be used. 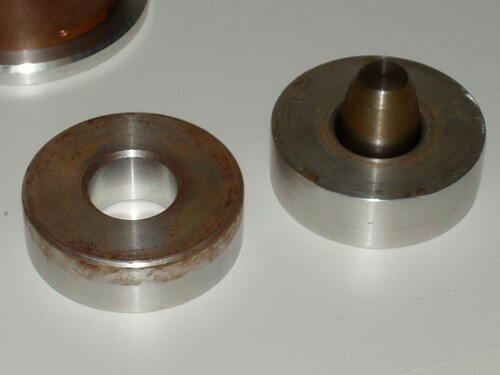 For the central flange in the 3" boiler, the formers and the steel piece you see sitting in the central hole of the rightmost former in the photo above are turned into dies. The plate is formed by forcing the steel piece through gently (I had to stop and anneal a couple of times) using a large vice. You can leave it to cool in air or quench it - Boiler Repair Fulham I quench it because I have no patience - the point being that it is the heating that anneals not the way it is cooled.